In this post, learn how to fix "Windows could not prepare the computer to boot into the next phase of installation" error while installing Windows 10/8/7. 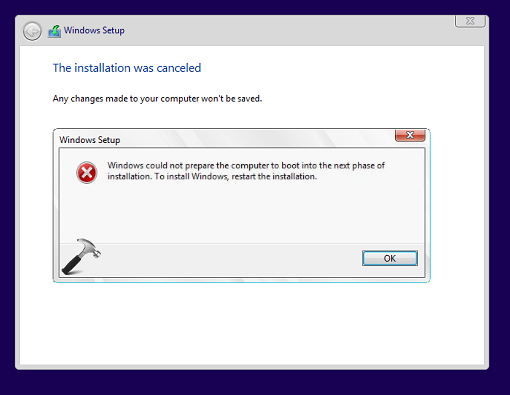 If you’re going to make clean install of Windows and you’re unable to proceed to due to some error, you may want help. Today, in this article, we’re going to talk about a well known issue that might occur while installing Windows. Windows could not prepare the computer to boot into the next phase of installation. To install Windows, restart the installation. After getting this message, our next move was to restart the installation. However, even after 3 attempts, we found no change in the situation. The error keeps appearing in a loop, ultimately leading to failure of clean install. If you’re also facing this issue while installing Windows 10/8/7, try out suggestions mentioned below, see if they helps. 1. Make sure your system is not connected to any other external devices while installation. 2. Check your hard disk for errors (refer FIX 1 here), just in case. 3. If you’re getting this error while upgrading, repair the boot records first and then retry with the upgrade. 4. For upgrade users, you must temporarily disable your security software and see if this helps. 1. Boot from the installation media, let the setup wizard start, click Repair your computer link. Then select Troubleshoot > and choose Command Prompt on Advanced options screen. 3. Close Command Prompt and restart the installation, this time you should be able to install Windows without any error. Good One, Disk clean helped me to resolve the issue. Fix 2 worked perfect for me. Past the install now and still working great! THANK YOU!!! hello, i have the same problem.´disk is not a fixed mbr disk… . i cleaned the system partition and there is no more partition on my hdd, and im going to install the windows again, i hope this work. ^^ It should work, try it. Good luck!